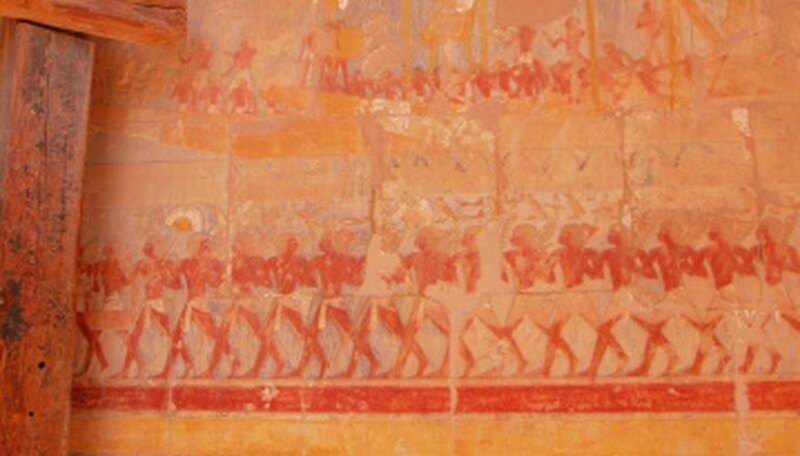 Ancient Egyptian paintings were brightly colored and enduring. Found in tombs and on papyrus, they were created from a paint called tempera. Tempera consists of a mixture of natural pigments held together with a binding agent and thinned with water, which helped the paint to stick the surface of the picture. Binding agents were made from egg yolks, egg whites, acacia gum, beeswax or a glue called casein. Casein is easy to prepare at home, making it the perfect base for recreated ancient Egyptian paint. Heat the milk gently until just under boiling point. Take the milk off the heat. Stir in 3 tsp. of vinegar to curdle the milk and separate it into curds and whey. Strain the mixture through a sieve. Discard the whey and place the curds in a bowl. Add a 1/4 tsp. of bicarbonate of soda to the curds to create sticky casein. Add powdered paint of choice and thin with water to the required consistency. For an authentic look, create your paints in the colors most commonly used by the Egyptians: black, blue, brown, grey, green, orange, pink, red, white, and yellow. The ancient Egyptians made their paints from natural resources such as ochre, malachite, lapis lazuli, chalk and cinnabar. All of these minerals needed to be ground into a powder. To save time, use ready made powdered paint. Alternatively, add food coloring to your casein. Experiment with the intensity of colors by adding more or less of your pigment to the binding agent. Supervise young children and ensure they don't ingest the paint.